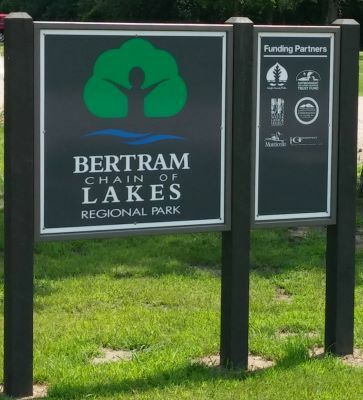 The Friends of Bertram is a volunteer group devoted to preserving and enhancing the experience of the Bertram Chain of Lakes Regional Park. Through various activities and efforts we seek to sustain the natural beauty and ecology of the park. We support interpretive and environmental educational programs at the park. We advocate for and promote the park. We provide volunteers and support when needed. We need your help. Please consider becoming an official member by donating an annual membership fee of $20 today. If you'd like to make an additional contribution beyond the $20 annual membership, click "Other Amount" and enter your desired amount. The first $20 will go toward membership. Your donation helps to fund various projects and events at the park including trail development, interpretive signage, educational programs, trail runs, earth day events, natural playground development, trail maintenance equipment, and more.